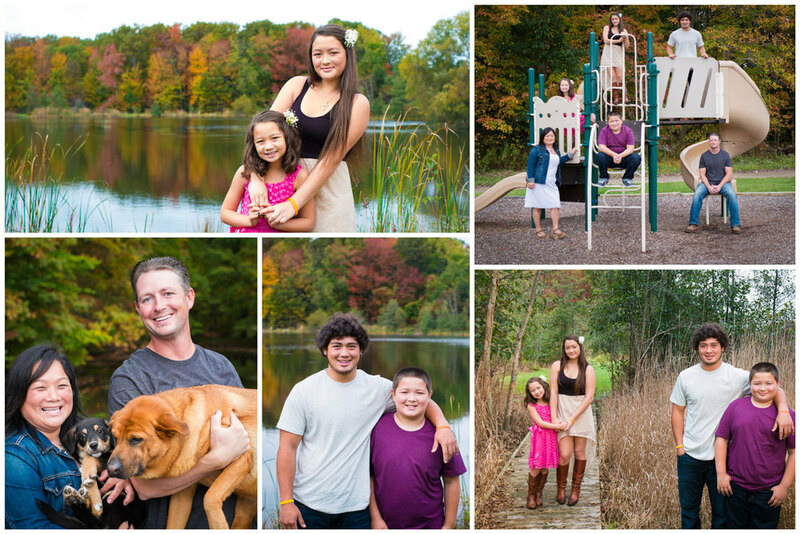 A few Sundays ago I was lucky enough to spend some time photographing the Martin family. A few days earlier I scouted the park we had chosen for the portrait session on a warm, sunny day, but, naturally, the morning of the portraits dawned overcast, drizzly and damp. We caugth a lucky break though and, as I watched the Martin’s and their dogs pour out of two cars at the appointed session time, the morning rain had stopped. The overcast sky helped to cut harsh shadows that full sun would have created and added some intensity to the colors of autumn that were nearly at their peak. I added some CTO (orange tint) and umbrella-modified flash at times to give a warmer look to the gray day. The Martin's were pros. Thanks to the Martin crew for the business and for the laughs and good time during the shoot.